As we slowed for our approach to Lock 24 and Baldwinsville, NY I noticed a faint hint of diesel fuel and that our faithful tug C.L. Churchill was sounding a little different, like maybe a cylinder wasn’t running up to par. After our successful landing on the wall above the lock and across from Paper Mill Island I investigated the engine compartment. I discovered that the #6 injector pump pipe was leaking fuel. This would account for both the smell and sound. 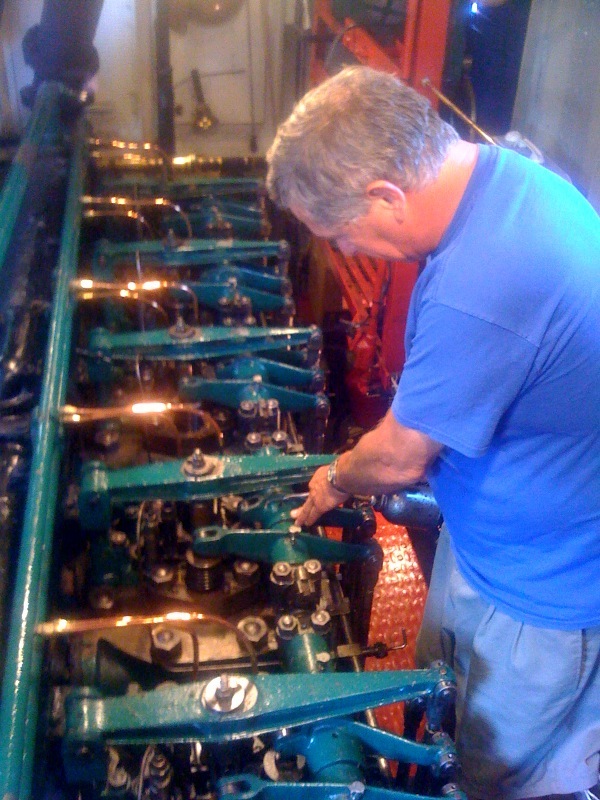 I’m not mechanically inept, but I’m certainly not a diesel mechanic either, which is why when the Tug Urger pulled up behind us 45 minutes later I was really happy to see the face of my colleague Chris Freeman hanging out the side door at his post as engineer. Chris faithfully answers the bell signal of the captain Jack Wright who calls down his needs to Chris who in turn makes the old Atlas engine respond accordingly. The Urger is the Canal Corporation’s Educational Icon. Now 109 years old, she’s on the Historic Register and is meticulously maintained, drawing crowds no matter where she goes. Chris Freeman, (aka “Freebird”, aka “The Bird”) and I struck up a friendship last year during the “Working on Water Tour” when the Urger, Peckinpaugh, Lois McClure, Churchill, and 8th Sea stopped at several ports simultaneously on Lake Champlain and the Champlain Canal. We stayed in touch over the winter and looked forward to the opportunity to practice moderation when our boats visited the same ports again this year. Baldwinsville was our first encounter of the season.